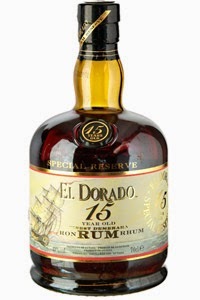 Last week I got all hot and bothered when I tried three rums from El Dorado, the 3, 5 and 8 year olds. I was stunned by the complexity in these rums for their age and also in their natural taste - none of them tasted artificial or sweetened. Now, though, I am back with El Dorado Part 2: The Tipsying, and I have the 12, 15 and 21 year bottlings from their luxury aged cask selection to taste. I couldn't be more excited. This is a rum that is rated massively in the web-o-sphere, if you give it a quick search. It is a blend of rums no younger than 12 years old, matured and all having been stored in old bourbon oak. This rum also impressed at the International Wine and Spirits Challenge taking home to Guyana a gold medal and title of "Best in Class." On the nose you get firstly the wonderfully sun kissed tropical fruit notes that slowly blend into coffee and slightly burnt caramel. Vanilla and sweet spices also manage to poke through along with the lightest touch of smoking maple wood. On the palate you firstly get coffee and toasted toffee, but it is much more savoury than might be expected, and there is also fruit and spice, with some smoke winding it's way through on the finish. The flavour is quite astonishing, wonderfully different, fantastically smooth and oh so pleasing - you only wish that it might linger a little longer. This rum is a serious departure from anything you'll pick up in your supermarket - the smoke and burnt sugars mixing with the more classical fruit is magnificent. It will come as a shock to some, and may be a little challenging, however it's a challenge that I think you should all take on. Available for £33.15 at The Whisky Exchange. This bottle is made up of rums ranging from a not too shabby 15 years old up to a whopping 25 years - we are really talking quality ageing here. 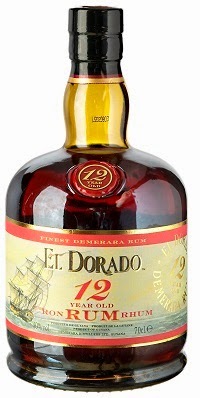 I know I have bleated on about the recognition that El Dorado has received, but this rum has won best in the WORLD a huge FOUR times in a row! That is insane - we are in the presence of greatness, and for god's sake put down your Sailor Jerry's in front of the master! On the nose there is an almost sherried whisky quality with raisins, brandy and fruitcake mixed with almond, dark sugar, toffee and orange peel. This nose is crazily enticing and really could pass for a whisky if presented blind - there's great complexity here. On the palate, the sweet spices rule, with the almond mixing with ginger and orange peel. There is cinnamon, coffee, dark sugar, nutmeg, coconut and honey. There is a taste explosion to be had and it whirls all around you, you need to take this rum slowly and consider it or all the work and expertise in the glass will be lost and wasted. This is a beautifully aged spirit for a whisky lover and rum addict. There is barely a better taste out there for me. This comprises great elements of both worlds and puts them together: the complexity of whisky with the sweeter, more tropical nature of rum. It's splendiferous. Available at The Whisky Exchange for £41.45. 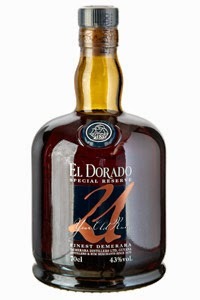 Last but by no means least is El Dorado's 21 year Special Reserve. The age of rums that go into this will likely vary based on the strengths of casks, as ageing spirits in barrels for a long period is no exact science. All that can be said is that the spirits in this bottle are no younger than 21 years old, and are damn epic. On the nose a honeyed brandy note kicks off with rich spices and ripe tropical fruit coming in - it's bananas with cinnamon, nutmeg and dark sugar. The 21yr is a bit more reserved than the 15 on the nose - a bit less up front, but hugely intriguing. On the palate the taste is sweeter than the 15 with the fruit being the driving force, along with oaky spice, vanilla, toffee, raisins, dates and dark sugar. On the finish, coffee, mocha and some chocolate come through, and like all the other rums I've tried from El Dorado it is sublimely smooth. This is a truly superb rum, tasty, interesting and complex. It is really stretching and challenging, not in a bad way that an austere Burgundy or young Bordeaux might be, but you'll find yourself stretching to pick out these fantastic flavours and not be quite able to place them with so much going on in the glass. This is a wonderfully constructed creation, and I enjoyed every minute I had with it, but I feel I'll need a bottle to fully get to grips with this giant of a rum. Completely astonishing. Available for £73.56 at Master of Malt. Before parting ways after this epic tour of Guyanan rum I needed to acknowledge the fact that I haven't included any signature drinks to match these rums. That's simply because if you even attempt to mix these masterpieces with anything else you deserve a severe and painful punishment that I am not allowed to detail for legal purposes. All I can do to recommend wholeheartedly that you pick up one of these bottles and sit down and savour it over many many nights, it will be a worthwhile investment of money and more importantly; time. you need a 25 yr review, the best rum in the world, hands down.